Basil Herb Arrangements. I like the sound of that. I should start up my own business sending them out for birthdays, anniversaries and graduations. Ok maybe not those special occasions but how about for get well bouquets. I mean basil does have medicinal properties. 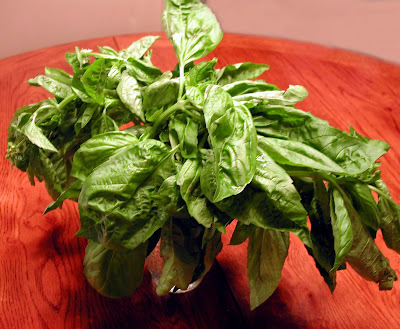 I'm sad because it is the end of the season for garden basil or any other herb for that matter. So you know what that means... Get your food processors and blenders out because we're making PESTO! And enough to last well into the winter months. With this recipe you can enjoy it now or bring a little summer back into the kitchen by storing it away in the freezer. Either way, you will feel like you just received a get well bouquet, only this one really will make you feel great. And, you can eat it! In a food processor pulse basil, nuts, garlic, salt, and pepper until finely chopped. Gradually add enough oil to form a smooth, thick consistency (while blender is running). Transfer to bowl and add cheese*. Season with more salt and pepper as necessary. Cover and refrigerate until ready to use. *Note: If you don't plan on using the whole batch right away, put some aside and do not add the cheese. Spoon the pesto without the cheese into an ice cube try and freeze. (The cheese tends to break down in the freezer). When frozen, transfer the pesto cubes to a freezer bag. When you are ready to use them, just thaw them in the refrigerator and then add the cheese. If you choose to use one or two cubes at a time, just a tablespoon of cheese per cube or to your own taste. Great recipe. I need to gather and pick all my herbs before we get frost. I'm sad, too. I don't want to pay a lot of money for herbs at the store! I need to try your ice cube trick. That's fabulous! I found out about the cheese breakdonw in the freezer - first hand. Pesto, on the other hand, it quite versatile. I never thought I'd like it, but pesto on pizza crust is very tasty. Fresh pesto is one of the most glorious things that summer brings! I use the ice cube method when I freeze large batches of pesto, but I've never had a problem with the cheese breaking down in the freezer, mainly because we gobble up the pesto cubes too quickly! I have so much basil in my garden, I need to use it before the seasons change! I love basil! We buy it at the market when it is cheap and make pesto to freeze! We do the ice cube thing too! Great tip! I love the freezing pesto trick. I freezed a bunch this past summer and now I have enough to last me the winter.